Before (Sep 30, 2015) and after (Nov 4, 2015) images of Waterton Lakes National Park showing November snow dusts in the eastern Canadian Rockies. Credit: Planet Labs. SpaceQ spoke with Mike Safyan, Director of Launch and Regulatory Affairs and Rachel Holm, Communications at Planet Labs, about their ongoing efforts in Canada. Even before the acquisition of Blackbridge in July 2015, Planet Labs had been making a push into Canada, announcing a deal in March of that year with Newfoundland headquartered R&D firm, C-CORE. At the time, Planet Labs said they were planning to develop products and services with C-CORE using their satellite imagery data combined with C-CORE’s expertise in remote sensing. Then just over three months later they announced they had acquired Blackbridge and its constellation of five RapidEye satellites which had been built by another Canadian company, MDA, as the prime contractor. The deal with Blackbridge also allowed Planet Labs to take advantage of Blackbridge’s network of 100 distribution channels and customers globally. Since the acquisition, one of the big projects the Lethbridge office was tasked to do, was to integrate the RapidEye constellation archives into the Planet Labs web platform. Circling back to C-CORE, now armed with access to RapidEye and Planet Labs Dove satellite datasets, they are using that data for energy monitoring and precision agriculture, and have become a big reseller of the data. The one potential issue with the RapidEye acquisition is the age of the satellites. The satellites design lifespan was listed as seven years. 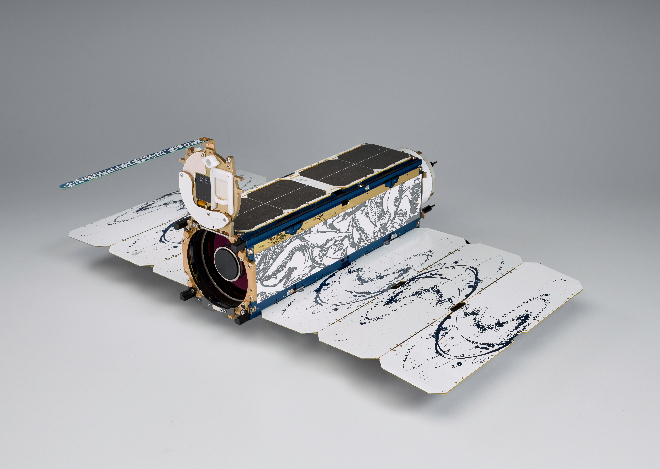 The satellites were launched in August 2008, meaning they’ve now exceeded their original design lifespan. However, many satellites function nominally well beyond the factory sticker date. And according to Mike Safyan, that’s the case with the RapidEye constellation. He says the satellites will function until at least 2020. In the meantime, Planet Labs is developing new sensors for future Dove satellites that will take up the slack when the RapidEye satellites finally reach their end. The five RapidEye satellites. Credit: Planet Labs. It should be noted that Blackbridge at the time, although based in Lethbridge also had an office in Berlin. In fact, the company originally was founded in Germany as RapidEye AG and Blackbridge subsequently acquired the company in 2011 after it had filed for bankruptcy protection. There’s irony in the history of RapidEye AG/Blackbridge and now Planet Labs. The original company was created in response to the German Aerospace Center (DLR) desire to commercialize remote sensing in Germany in 1996. They succeeded, but then saw RapidEye AG bought by a Canadian company and then bought by an American company. Of interest, Planet Labs, originally created as Cosmogia, was created in 2010 by three NASA Ames Research Center (ARC) scientists, Chris Boshuizen (CTO), Will Marshall (CEO), and Robbie Schingler (Chief Strategy Officer). The latter two are still with the company. Their efforts though, were spurned on, by the then NASA ARC director, Pete Worden, who was a strong advocate for the rapid development of small satellites. 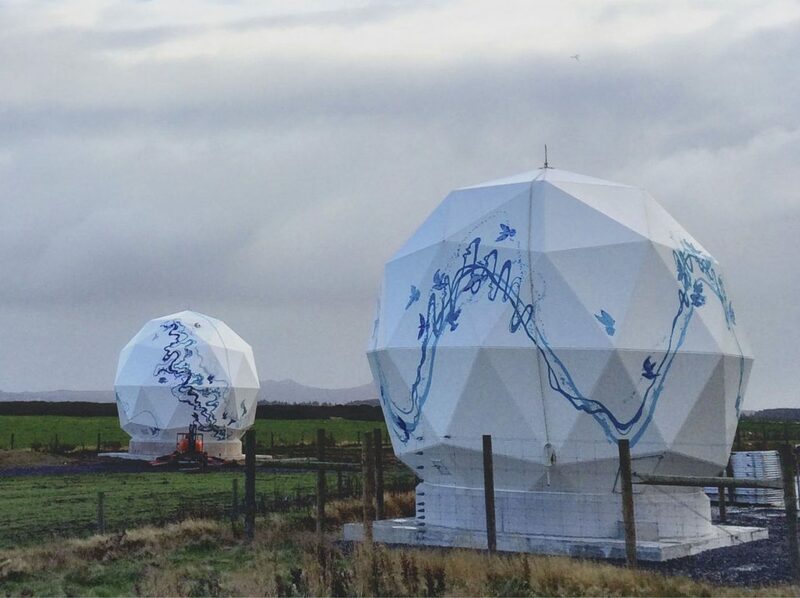 Planet Labs New Zealand ground station. Credit: Planet Labs. One of the other projects Planet Labs is working on in Canada is bringing their ground station in Inuvik online sometime this year. They currently have 30 antennas spread over 12 locations globally. The new ground station includes what the company calls “cutting edge” antenna technology allowing X-Band, S-Band, and UHF in one single system. 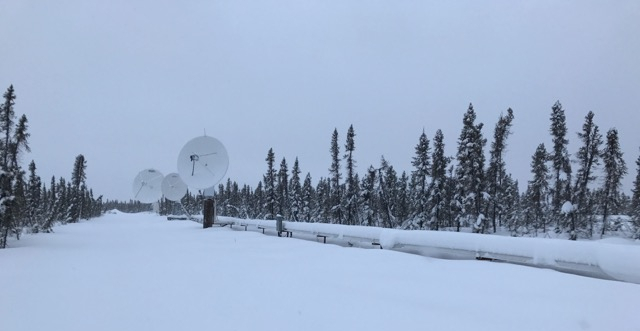 Inuvik is already home to the government owned Inuvik Satellite Station Facility (ISSF) which is administered by Natural Resources Canada, while MDA is under contract to provide support and operate the facility. Notable customers at ISSF include the German Aerospace Center (DLR), the Swedish Space Corporation (SSC) and the Centre national d’études spatiales (CNES). Planet Labs is not located there though. Their four 4.5 meter dishes are located at the Canadian Satellite Ground Station Inuvik Inc.’s (CSGSI) new facility. That facility is a wholly owned subsidiary of Kongsberg Satellite Services (KSAT) of Norway. SpaceQ spoke with Tom Zubko of New North Networks, who built the new facility for KSAT, and learned that KSAT originally planned on being at the government location, but that the terms were too onerous and would cost the company too much. So they went ahead and built their own commercial facility which Zubko describes as “complementary” in a CBC article. The new commercial ground station built by New North Networks. Credit: New North Networks. Zubko said the facility is ready and took six months to construct. One major issue that has come up with the new facility is the slow Canadian regulatory process. According to Zubko, the Remote Sensing Space Systems Act, which regulates licensing, was written at a time (2005) when commercial entities didn’t move at the speed they do today. New space companies, especially in the small satellite market, are able to build satellites in months and get them launched within a year. Zubko said the government isn’t keeping up the changing times and it needs to be more responsive. Ultimately KSAT selected the Inuvik location because it’s ideally situated for a ground station in the northern latitudes of North America. They had been considering a location in Alaska. However, if they knew then what they know, they may have picked another location. Neither KSAT or Planet Labs have received regulatory approval to operate their ground stations. KSAT will operate two dishes, a 13 meter dish and a 3.7 meter dish for Terra Bella, recently acquired by Planet Labs. KSAT has a contract in place to supports Europe’s Copernicus program, but can’t use the ground station in Canada yet. Planet Labs had hoped to have the ground station up and running by now. They have an upcoming launch tentatively scheduled on February 15. That launch, on an Indian rocket, will see them launch a record 88 small satellites, of the over 100, to be launched on that mission. The Remote Sensing Space Systems Act is administered by Global Affairs Canada. They in turn consult with other departments including Natural Resources Canada, the Departments of National Defence, Public Safety, Innovation, Science and Economic Development Canada, and the Canadian Space Agency. Unfortunately, none of these agencies have a set time-frame needed to get back to Global Affairs in the consulting process. This can really slow the process. The government talks about innovation, but here we have two newer space companies investing in Canada who are being slowed down by the regulatory process. Perhaps as part of the innovation process, the government could work on streamlining the regulatory process. The government of the Northwest Territories, in an effort to support this new industry in Inuvik, is building a $100 million fibre line from Alberta to link to the ground station facilities and the community. Their hope is that other companies will want to take advantage of the ground stations facilities with its fast fibre access. The new fibre line is to be completed by June. After acquiring Blackbridge, Planet Labs now found itself with offices in Lethbridge and Berlin to go along with their San Francisco headquarters. They then opened up offices in Amsterdam and Bellevue, Washington, a suburb of Seattle, last year. Planet Labs Dove satellite. They weigh 4.7 kg and the dimensions, not including the solar panels, are 10 cm x 10 cm x 34 cm. Credit: Planet Labs. Currently they have 60 Dove satellites operating along with the 5 RapidEye satellites. As mentioned earlier, they are launching another 88 Dove satellites on an Indian rocket on February 15. 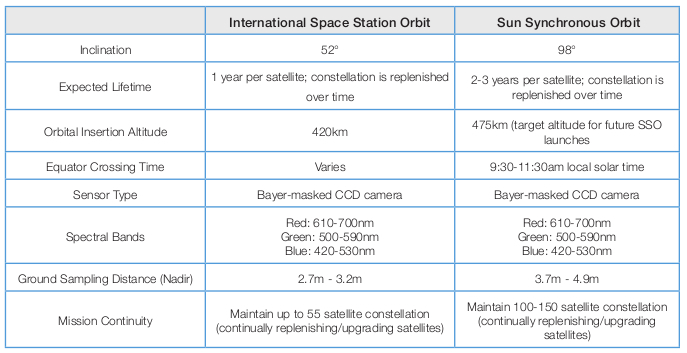 Planet Labs orbit, constellation and satellite specifications. Credit: Planet Labs. 48 of those Doves are in International Space Station Orbit while 12 are in Sun Synchronous Orbit (SSO). The additional 88 satellites will be placed in SSO, giving Planet Labs 100 in SSO, which was what they’ve trying to achieve since the company was founded. Last week, Planet Labs announced they were acquiring Terra Bella, another earth observation company which is owned by Google. Terra Bella currently has seven high-resolution satellites in their constellation. 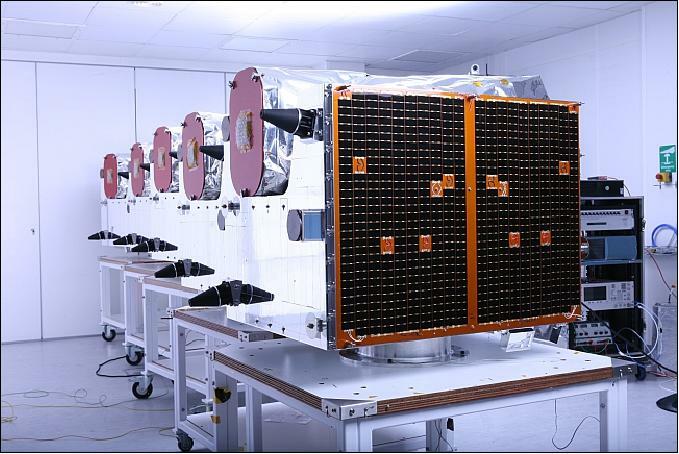 So Planets Labs is going from their current 65 satellites to a record 160 satellites. And they’ll grow beyond that. Terra Bella is already scheduled to launch another six high-resolution satellites in the comings months on an Orbital ATK Minotaur-C rocket. Terra Bella also has another two satellites to launch after that. To achieve its near term goals, Planet Labs needs to have those 88 satellites successfully launched on February 15. But what if something goes wrong? This is where Planet Labs shines as an example of a new company innovating. They are capable of manufacturing 20 satellites a week. Each new iteration of Doves build upon the past generation, employing updated software and sometimes new sensors. But the basic design allows them to build rapidly. If need be, they can manufacture 1000 satellites a year with their current manufacturing techniques. So if the reliable Indian PSLV launcher should somehow fail, they can have replacement satellites built within months. They also have backup launch dates booked to send up more satellites. And should you think they are only going to launch 88 Doves this year, think again. They have a technology demonstration program in place and plan to launch an additional two satellites per quarter just to test new technologies for the next generations of Dove satellites. With Planet Labs push in Canada they have joined the industry group, the Canadian Space Commerce Association. Their goal is to have a voice in space policy and working with regulators. 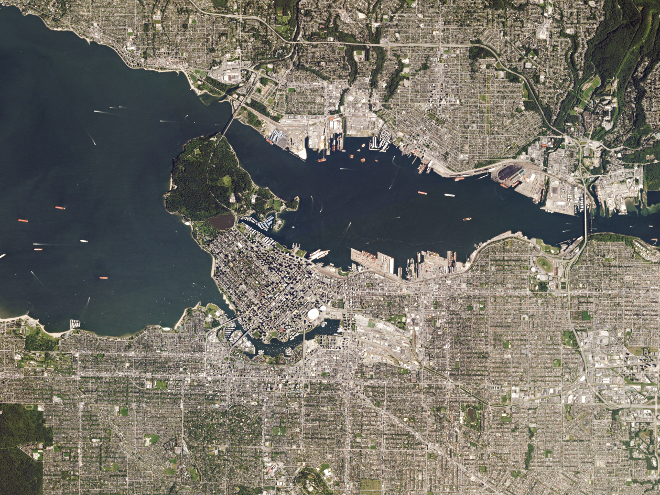 Vancouver’s famous Stanley Park, one of North America’s largest urban parks, extends into the mouth of Burrard Inlet. June 26, 2016. Credit: Planet Labs. For those who like to look at satellite imagery, Planet Labs engineers developed a free Chrome web browser plugin, Planet View, in their spare time, that pulls in a new image from their database every time a new tab is opened. Having tried it, I find it’s really cool, you see and learn more about our planets diverse geography.